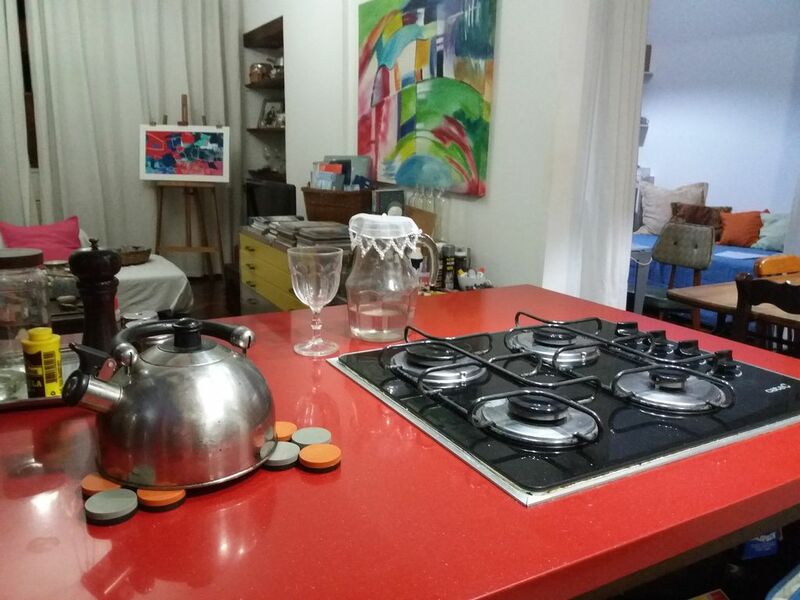 Feel comfortable and very at home in Copacabana with art and style! The apartment is located on a main street, near the beach and beside a metro station. It is in the heart of Copacabana. The location is very lively and safe!! It is a two bedroom , two bathroom apartment 80m2, 9th floor front apartment. Clean and safe building with 24 hour doorman. It is a mixed use building with shops on the first two floors. There are two elevators and 4 apartments per floor. The elevator hall and the corridor are large and well-ventilated and full of light. I am an artist, Sonia Gil. The apartment was my home and studio, I am an architect and visual artist. I am living in Lisbon since August2018 and the apartment has been trand my holiday home when I come to visit relatives in Rio. I have been renting a smaller apartment since 2013 and I am a super host! My friend Neyde will be taking care of my guests.She lives in the same building, and that is a plus!! She will be taking care of my guests as if I was there!! I also like to travel as an Airbnb guest and have had great experiences! So, it is a great pleasure to be able to welcome people to my beautiful city !! The location is excellent, 7 minutes from the beach, just beside of metro Station Siqueira Campos, near banks, supermarkets, restaurants and all kinds of shops and with very good transportation, well connected to other neighbourhoods. I am renting the full apartment, two bedrooms and two bathrooms, living and dinning room and kitchen, this is not shared with anyone. The apartment is in a very convenient location, in the heart of Copacabana. There is one bedroom with double bed and a second bedroom with two single beds. The building is clean and safe with 24 hour doorman. I have great pleasure in receiving guests from different parts of the world and sharing the wonders of Rio de Janeiro, this incredible city that I love so much! I am an artist and architect. I love travelling and have had great experiences using short term rentals. I have recently moved to Lisbon and have decided to transform my former home and studio into a holiday home for people who like me enjoy staying local, in special places and away from tic tac hotels. My Neighbour and friend Neyde Trotta is my co-host and will take great care of you and your friends or family!! I have made the renovation project myself, pulling down walls and integrating the kitchen with the living room. Everything was planned to make this apartment unique, cosy and special. So, This property is for people who enjoy staying in places with a personal style instead of "tic tac" hotels. And it has a great location in a very lively and safe neighbourhood, 7 minutes from the beach, just beside of metro Station Siqueira Campos!! The apartment was the residence of an artist and was renovated to be transformed into an open space with integrated kitchen. Expect lots of color, cozyness and a warm shower or a tub of hot water for relaxing after a long day of having fun in Rio! The main bedroom has a mosquito net which gives protection from insects and also a romantic touch! The apartment has washing and drying machine!! There are four chairs on the table, but the table is big and six can be seated. TV with netflix streaming for watching movies. Art coffee table books and in the bedroom there is a small private library with mainly books in portuguese.